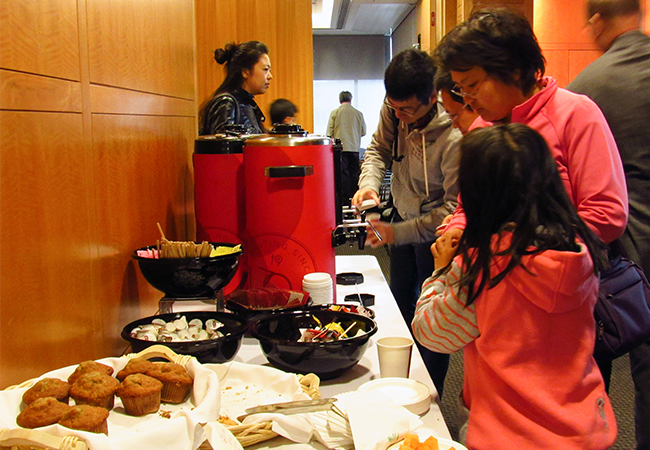 Event attendees enjoyed breakfast before the start of the Scanning Probe Microscopy Short Courses and Training Workshop. 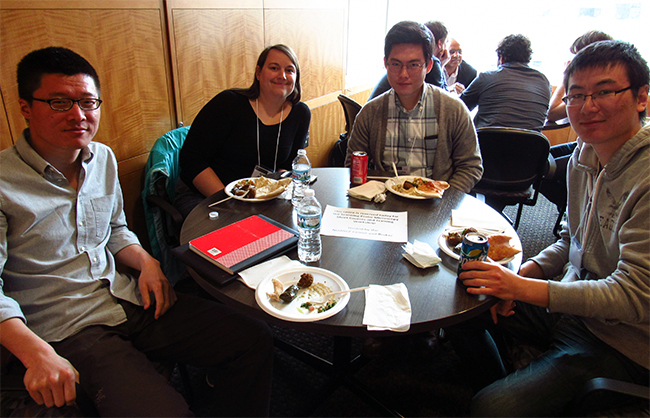 Event attendees grabbed coffee and a bite to eat before the first talk of the workshop. 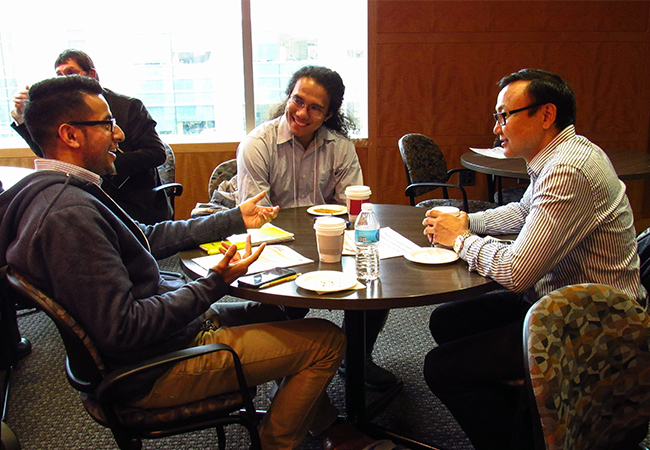 Event attendees chat over breakfast. 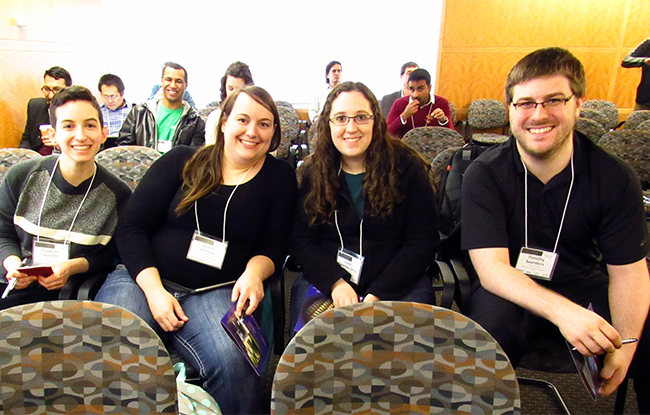 University of Wisconsin-Madison graduate students Elizabeth Laudadio, Arielle Mensch, Isabel Foreman-Ortiz and Timothy Saunders found seats together before the start of the workshop. 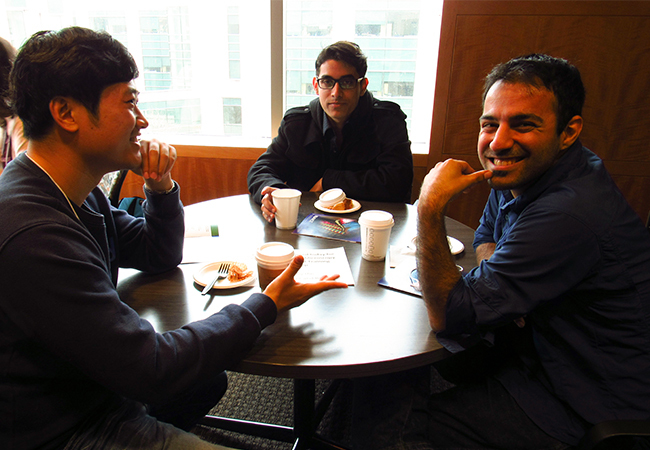 Event attendees converse over breakfast before the start of the day’s events. 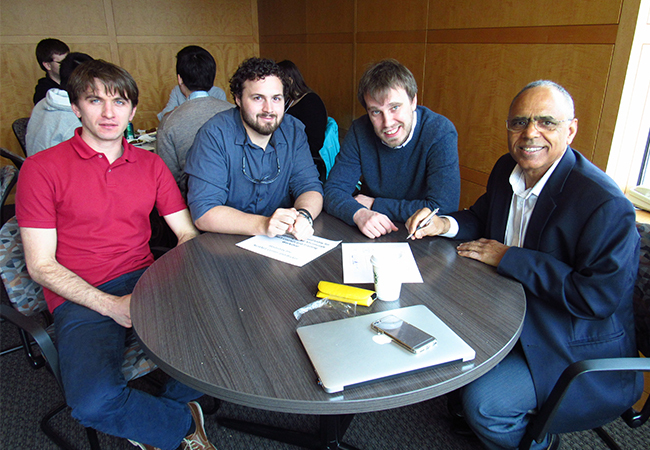 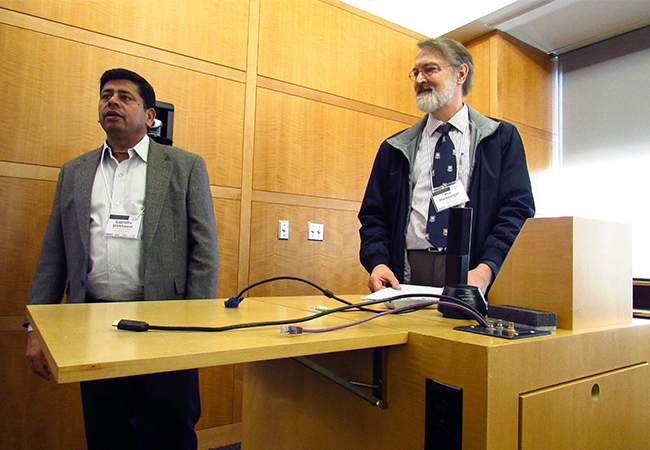 NUANCE Center director and professor Vinayak Dravid and Applied Nanostructures president Ami Chand conversed at the front of the room before the start of the workshop. 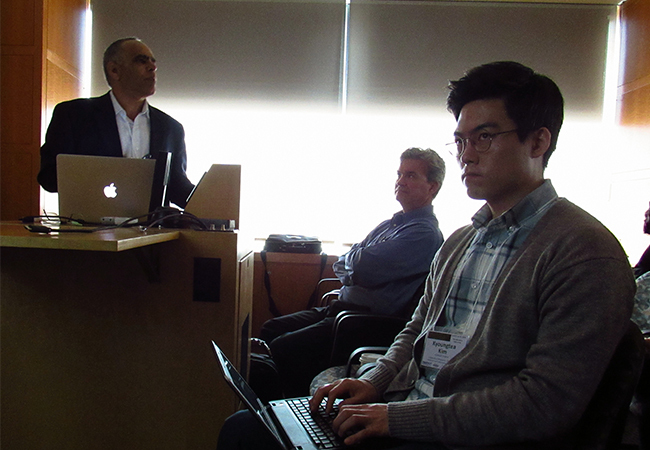 Professor Vinayak Dravid delivered the opening remarks for the 2016 Scanning Probe Microscopy Short Courses and Training Workshop. 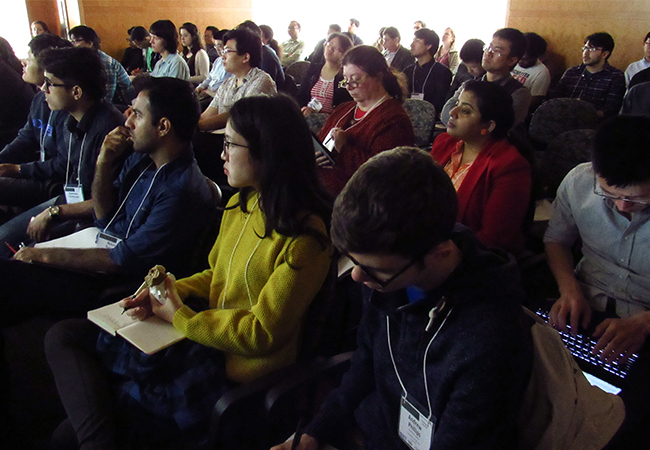 Seventy-nine attendees, including undergraduate students, graduate students, postdoctoral fellows, professors and research associates from various universities as well as science technical staff from several companies attended the 2016 workshop. 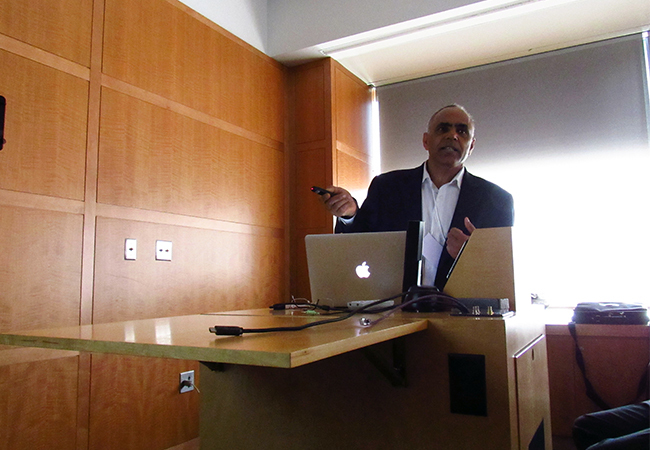 Materials science and engineering associate research professor Gajendra S. Shekhawat introduced the next speaker, core facilities director Phil Hockberger. 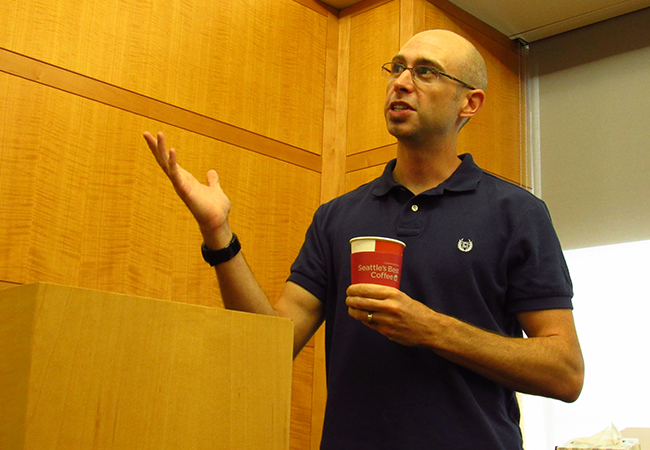 Phil Hockberger, associate vice president for research for the Office for Research, discussed the importance of educational courses in core facilities. 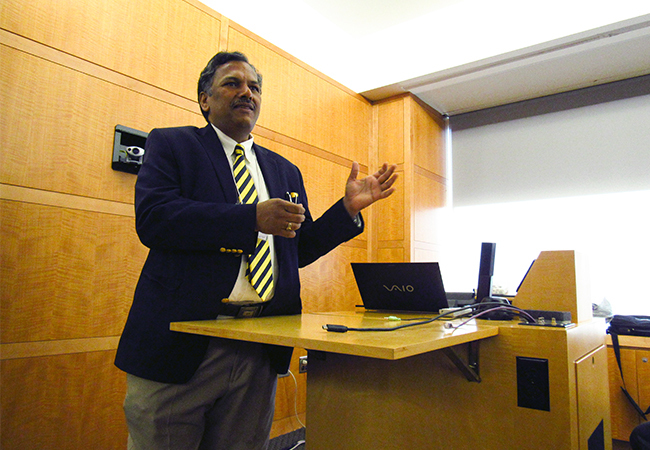 Dr. Ami Chand discussed the advances in the scanning thermal microscope. 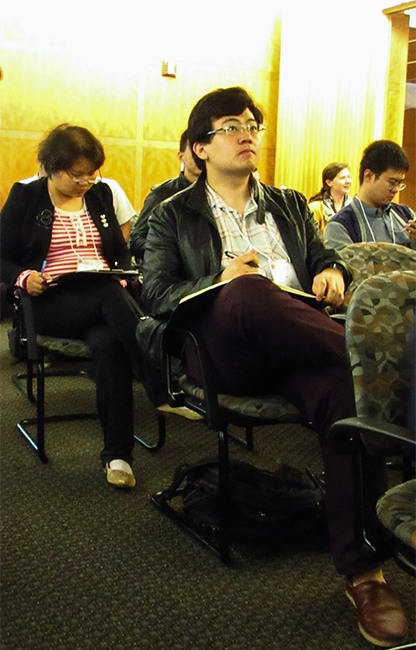 University of Wisconsin-Madison graduate student Kyoungtea Kim took notes during Dr. Ami Chand's presentation. 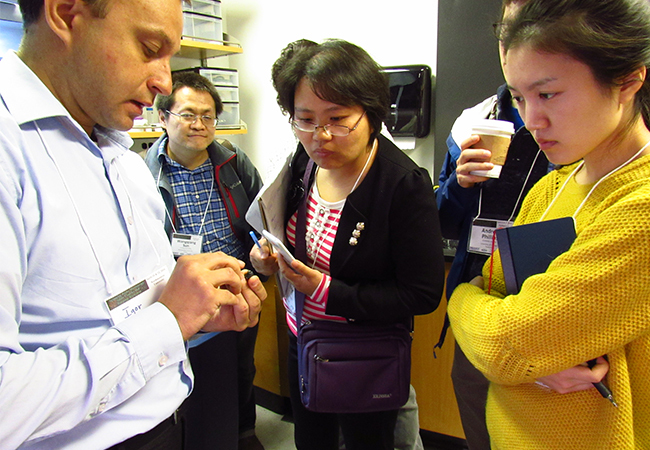 Bruker Nano Surfaces technical support engineer Igor Titushkin explains the Bruker Dimension FastScan Atomic Force Microscope. 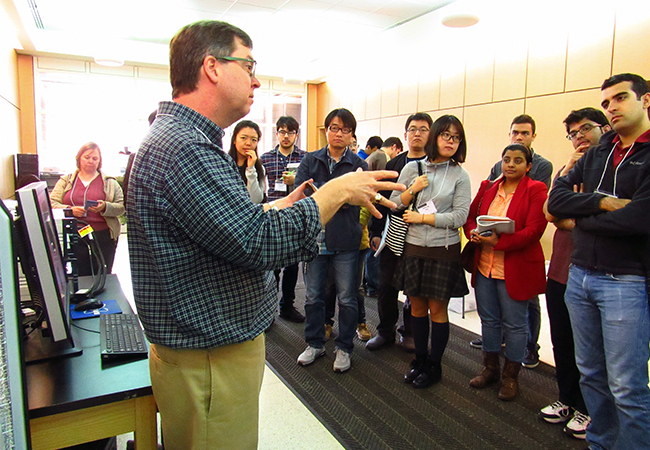 Students gather closely to listen to Igor Titushkim's explanation. 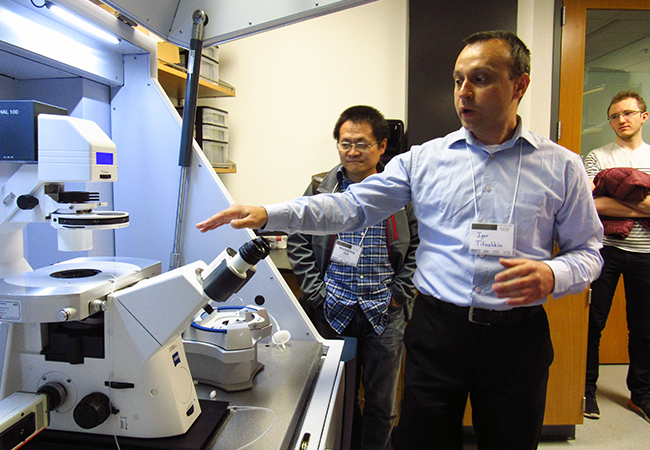 Dr. John Thornton provides demo and training for the Bruker ICON System. 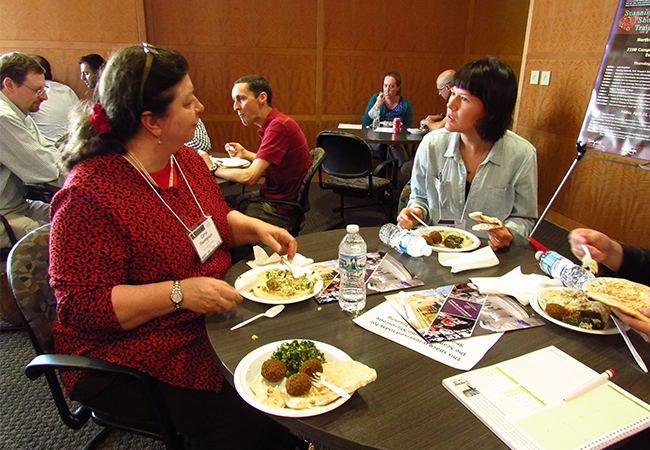 SPM Workshop attendees enjoy their Pita Inn lunch. 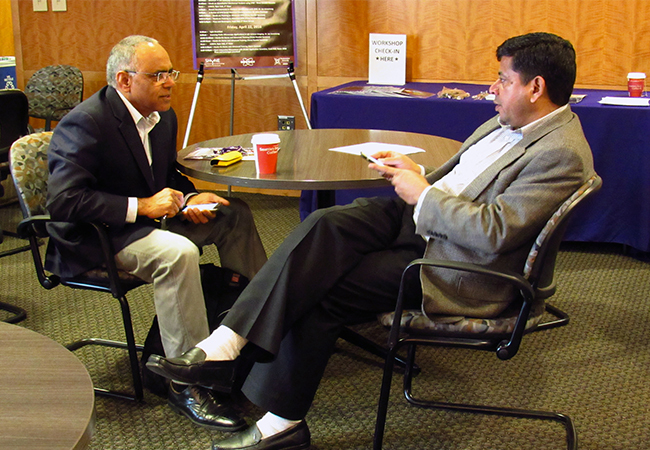 During lunch time, event attendees converse with Dr. Ami Chand. 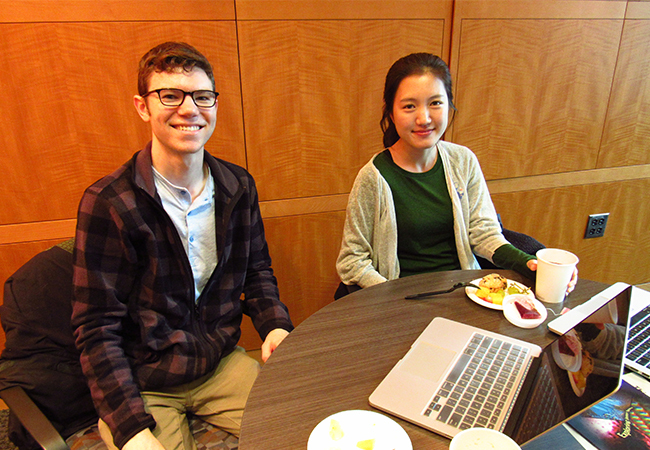 Northern Illinois University professor Carol Thompson and Fermilab postdoctoral fellow Yulia Trenikhina talk over lunch. 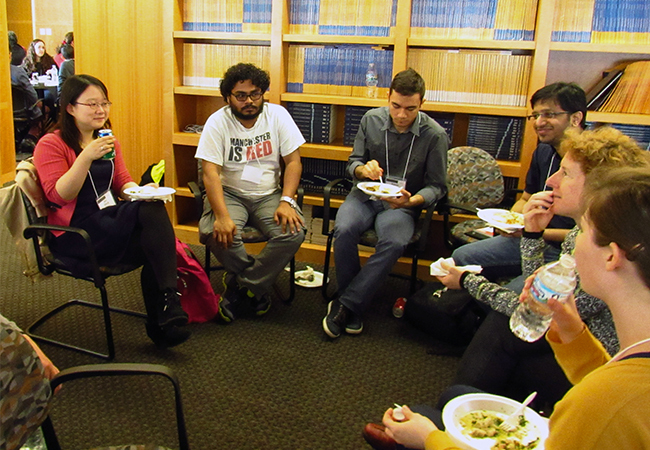 Event attendees arranged their chairs in a circle for lunch time. 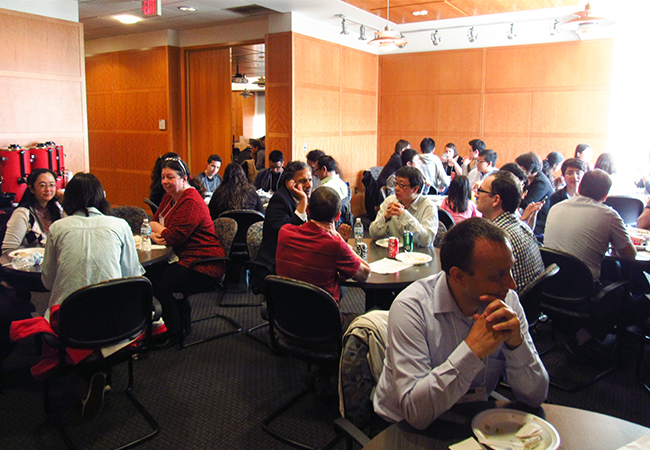 Event attendees enjoyed their lunch. 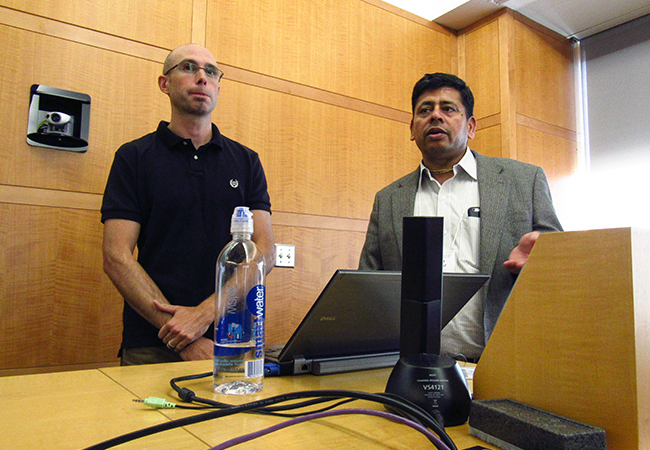 Professor Gajendra S. Shekhawat introduces Dr. Ian Armstrong, Bruker Applications Scientist, to the audience. 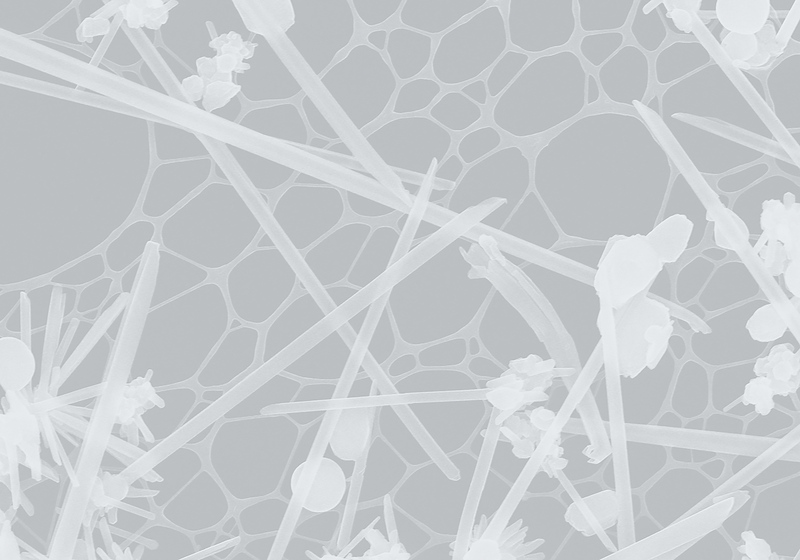 Dr. Ian Armstrong explains the recent developments in chemcial identification with SPM. 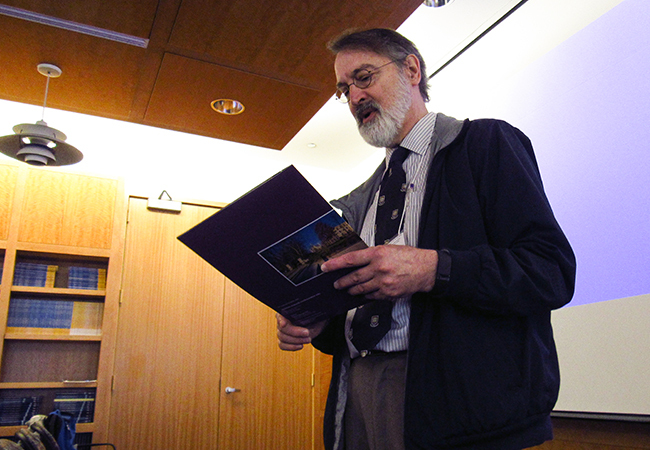 One event attendee taking notes during Dr. Ian Armstrong's presentation. 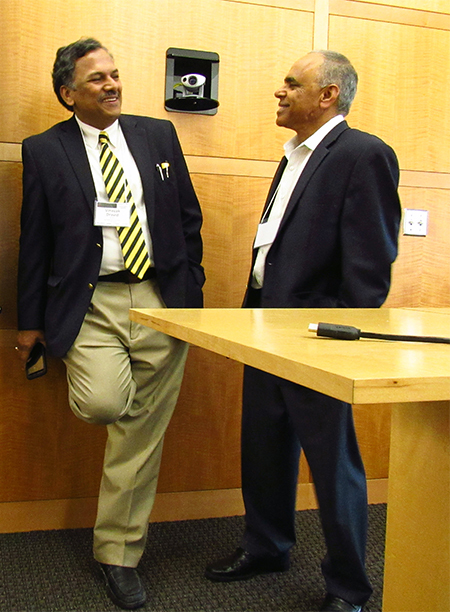 Dr. Ami Chand and professor Gajendra S. Shekhawat chat before the second day's events. 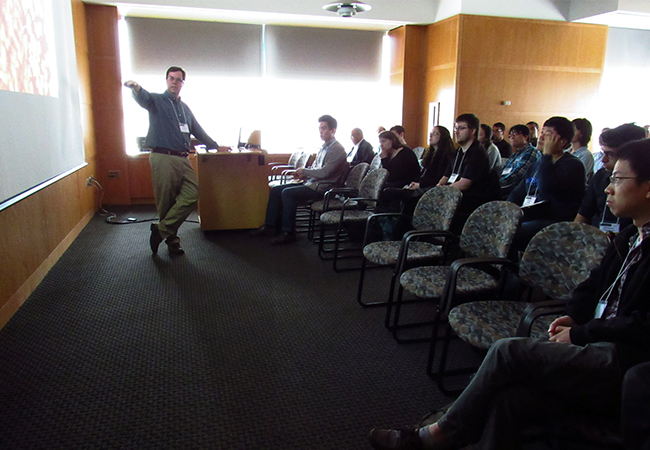 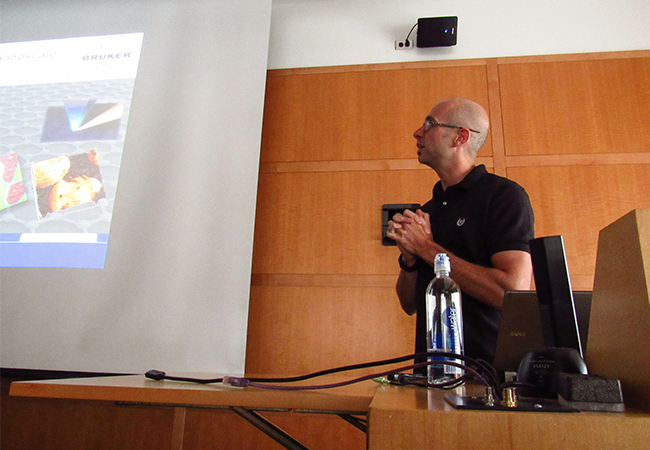 Dr. Ian Armstrong started the second day's events with a talk on the scanning probe miscroscopy applications in life science imaging. 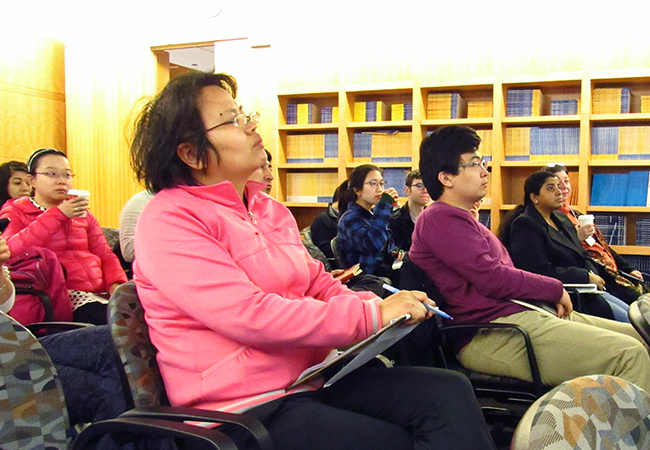 Many event attendees listened attentively to Dr. Ian Armstrong's presentation.